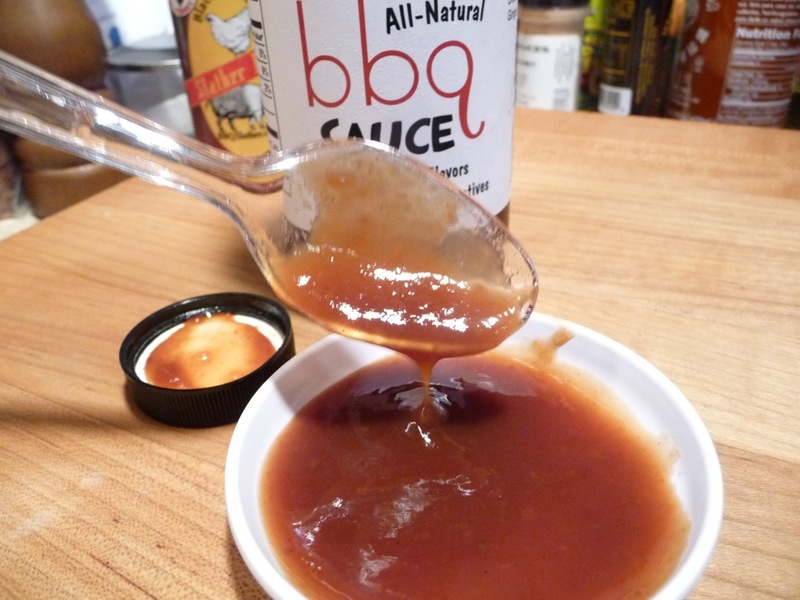 Continuing our series about Maryland based BBQ sauce companies, we present our review of Abrams Original BBQ Sauce from Laurel, Maryland. Henri and Kim Abrams started their company the way many couples have, with a recipe and a backyard full of friends and family cheering them on to market their product to the masses. They are “passionate” about their product using only fresh ingredients, and their original “tangy” sauce is “perfect for those who prefer mild BBQ flavor with a hint of kick”. Abrams BBQ was started from a dare. After years of cooking and encouraged by family and friends, we took a leap of faith. We went to community yard sales to see if others would enjoy our products and they were a success. We always sold out our stock of 100 within one hour! People were chomping at the bit for more! 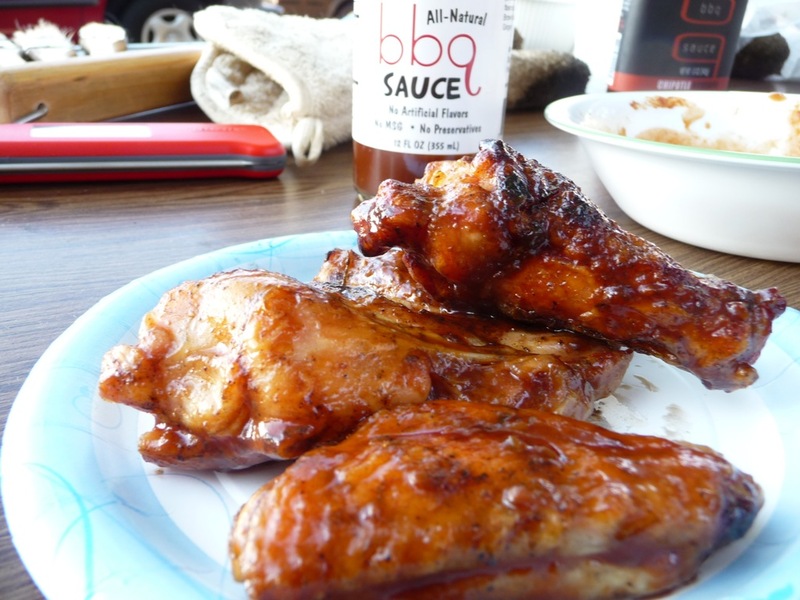 We knew we had a winner with our sauces and meat rub — try some, and you’ll agree! 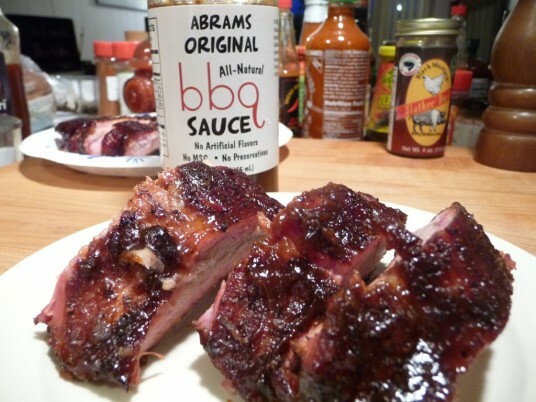 Abrams Original All-Natural BBQ has no artificial flabors, MSG, or preservatives. For this review, we tried Abrams Original on both ribs and chicken wings. The results were incredibly good. Texture & Appearance: – A very silky sauce with soft bits of ginger and peaches throughout. More golden brown than red due to the inclusion of peaches. This has the consistency of a glaze without the bright sugary shine. Taste Straight Up: – The first taste is of a very light tomato base, sweetened by the peaches. Next comes a bit of vinegar edge, but then the ginger becomes the dominant flavor as it spreads through your mouth. And I love ginger, but it seems like an odd flavor to be predominant in a BBQ sauce. Heat Level: – This sauce is all about flavor, not about heat. The only warmth I experienced was from the ginger, which can be pretty intense if overdone, but it just adds to the uniqueness of this sauce. Label/Graphics: – I love the clean look of this label. A white background with simple font, it’s easy to read and isn’t cluttered by distracting graphics. Reminiscent of the “Bone Suckin” label, it’s very straightforward in it’s presentation. Overall Rating (Taste on Food, Final Thoughts): – As is the case with most good BBQ sauces, the flavor improves with grilling. The sweetness is accentuated, and the ginger takes its place as a wonderful flavor enhancer, especially on pork ribs. (Thankfully this is not one of those thick, gloppy products that you have to scrape off your ribs with a knife!) I’d love to try this next on pork & pineapple skewers, but that means I’ll have to get more…. yes, the bottle is empty. Henri Abrams has done Maryland proud by introducing another great BBQ sauce to the world! Please visit AbramsBBQ.com to order some and learn more about them. The are active online and reguarly bring forth useful information to their viewers, for example, last week they covered the masterbuilt electric smoker review and have promised to keep the reviews coming. A perfect grill or BBQ is such a pleasure to own and operate. Doomer’s Q Sauce – the post that started it all. Todd and Jo Dooms have freakin’ nailed it! They truly are “BBQ Maryland Style” ! Red Brothers from Sykesville, Maryland has a trio of sauces that rock! Jo and I had the pleasure of meeting Henri & Kim at Pork in the Park. I love their sauces. Peaches are my favorite fruit and they give this sauce a wonderful flavor and aroma. Yum! Thanks Todd, I am still in love with the chocolate sauce. That does sound good even though I’m not a big peach fan. The ribs look very nice too! Chris, the peach just brings a nice gentle sweetness to the sauce. To call it “fruity”, as in Georgia Peach & Vidalia Onion hot sauce, would not be accurate. ..it’s more like “mellow”. I really enjoyed it on the ribs! Glad you enjoyed the sauce. Your original sauce is fantastic.Keep up the good work. Thanks John, that comments like yours keep me going! Brian – sign me up! I love fruit based sauces of all kinds, so this is right up my alley!